Home DIY Projects	70’s Bathroom Makeover! Hey, friends! Welcome to throw back Thursday! I’m going to share a few before and after pictures of the 70’s bathroom makeover we did a few years ago at our lake house. It was quite a transformation, let me tell you! Come check it out! So, this is how this little bathroom started when we bought our lake house nearly 7 years ago. There was even carpet on the floor that was as old as the house! The bathroom was a total gut job, other than the tub. It was still in fairly good condition, plus it would have been a nightmare to remove it. So, it stayed and just got a major cleaning. This is how it looked shortly after the purchase. Yes, it still had the original gold tile! Once the entire bathroom was gutted we were able to start with a clean slate. We tiled the floor in a simple, black marble. For part of the walls and the shower enclosure, we used white subway tile with black accents. We replaced all of the original shower hardware with new polished nickel fixtures and added a new white shower curtain. Because there is no linen closet, we hung this towel rack on the wall to hold clean towels. Even at the lake I like to use white, since you can bleach them and they still look great! There is a long hook rack on the back of the bathroom door to hold wet towels or bathing suits. The bathroom got a new toilet as well. We replaced all of the toilets in the house with “comfort-height” toilets. This might not be the best choice if you have small children, but for a lake house will mostly all adults, it’s nice! We replaced the original sconce with this little brass beauty I found on eBay. It didn’t come with glass shades, so I found these at Lowe’s. I thought the pattern on the shades look like fish scales. The fixtures goes along with my obsession with nautical lighting and lamps. I think the fish resemble sea serpents. What do you think? Anyway, I think it’s a cool fixture even though I am not a fan of snakes of any kind. I bought this adorable sink at an antique store in Doylestown, PA and hauled it down to the lake. I love the rope detail around the edges and the scalloped out places for soap on the sides in the shape of a leaf. Every time I wash my hands in this little sink, it makes me smile. 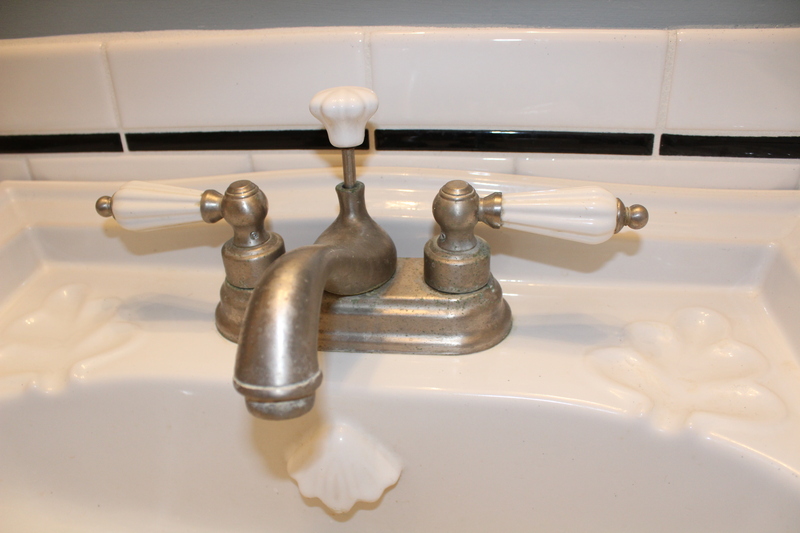 I was told by the antique dealer that this is the original faucet, which I LOVE. You can’t replicate this patina! Isn’t it the sweetest thing? This towel bar came from Pottery Barn years ago I believe. It’s wrought iron and looks old, which is why I love it. You can see more of the tile work in the photo below. Nothing is more classic in my book, than a black and white combination! This painting is one of my favorites! I found him on eBay for $12. Since this bathroom is in the basement beside the bunkhouse and man-cave, I think he fits right in with the guys. The original mirror was just a frameless rectangle. I replaced it with a vintage round mirror with etching. It looks like it belongs here! The built in shelf is original to the house. It had a little door on it, but we removed it so it wouldn’t hit the new sconce. It’s nice to have even a little bit of storage in this tiny bathroom. It gives people staying in the Bunk House a place to put their toothbrush, and toiletries. See that little moose on the second shelf? My husband dug him up while he was removing some shrubs the first year we had the house. It probably belonged to one of the grandchildren of the folks that built the house. I like to keep things like this as we unearth them. I’m sentimental like that. This was the last bathroom we remodeled in the lake house and it turned out to be our favorite! I love the subway tile and the marble floors. It’s a classic look that will never go out of style and could have been in the original house in the 1970’s. (Too bad it wasn’t, or we would have kept it!) Also nice is the fact this bathroom is on the basement level, so folks can come in from the lake or yard and not worry about tracking water or dirty feet throughout the house. It’s also where Lacey can come in from a swim and get dried off before heading upstairs. (She is wet or damp 90% of the time) Here she is worried about the number of geese in someone else’s yard. She loves to chase them out of ours. Good girl! This was such a rewarding remodeling project! It was a lot of work, but well worth our efforts. And, we love the results! Here’s another before and after, just for fun….